Defunct Audio Manufacturers - So - audiotools.com. The company was incorporated in August 1997 in nearby Raleigh and started manufacturing speakers shortly thereafter. The speakers received rather mixed reception but they had a pronounced midrange which suited some valve amplifiers well but less so with transistorised amps that represent the bulk of the market. This lead the Byers to approach China based loudspeaker designer Phil Jones in 1998 to design a new line of speakers that featured drivers from his new Chinese company American Acoustic Development. Initial sales of the new line-up were promising which led the company to move in 1999 to new premises in Raleigh that were more than 500 square meters in size and a new sales team was hired that included David Berman formerly of California Audio Labs, by 2000 Mr. Berman had become general manager of the company and by late 2002 he had had bought Soliloquy off the Byers and taken over the presidency role at the company's board. Mr. Berman instigated a number of changes within Soliloquy after taking over, he moved cabinet construction in-house and in addition to the manufacturing side steered the company towards distribution with them handling the USA distribution of products such as loudspeakers by aforementioned AAD and separates from Marsh Sound Design. By 2004 things start to go wrong for the company but we have not managed to find out exactly why, one story is that the owner was involved in an accident in early 2004 and things started to go downhill after that, another one is that when AAD opened up their own USA distribution network they stopped supplying Soliloquy with drivers. Not sure if either of these is correct but the latter chimes in with the fact that the company withdraws from the market in 2004 and by late that year is only selling B-Stock speakers via their website, they announced that their product line would be revamped with new drivers in early 2005, the proposed new line-up would add an I to the end of each model and they would also be available in “special” versions with better finish and drivers that would have an IS at the end of each model name. By 2005 the company had been thrown out of their rented premises and the jigs and other tooling was thrown away, the president of the company was still offering support and driver replacements in late 2005 though, and assured punters that the company would be back in 2006 with a new line-up, but nothing has been heard from Soliloquy since and the company was dissolved in 2010. A Hayward, California, USA based company founded by the Lau brothers in or around 1990 to manufacture valve amplifiers under the Golden Tube Audio brand and did so with some success, but ran into problems in the latter half of the decade, started manufacturing home theatre amplifiers under the Golden Theatre name around 1999 and disappeared in early 2002. There is a fairly low volume mailing list on Yahoo that deals with the Golden Tube amps. Company based in Auckland, New Zealand and owned by Doug Higham, incorporated in August 30, 1963 and the earliest products from the company that we can nail down appear to be extension loudspeakers for radiograms, that would normally date them in to the mid to late 50’s but the Radiogram survived a bit longer in New Zealand than it did in the west partly due to the strict import regulations that the country had. The company is sometimes listed as going back as far as the 1920’s but taking a further look into that it seems that people are confusing it with The Sonophone Co. Of Canada Ltd. branded products that were imported from Canada. In addition to the loudspeakers manufacture the company starts shipping amplifiers and receivers in the 1960’s and these look quite good for the time, the casings and finish are heavily influenced by British designs but the electronics look more inspired by Japanese designs from the same time, which is no bad thing, by the late 60’s Japanese amplifiers in general were much superior to their British equivalents, fit and finish is quite good, the receivers have the tuner board on an individual PCB and screened separately from the amplifier section. Whilst the amplifier and loudspeakers from the company were all locally made they also had some other hi-fi separates that are much rarer and not made in-house, the cassette recorders were sourced from Japan and rebadged and the turntables from Sonophone used foreign tables housed in locally made plinths, typically Garrard and Thorens models. The company was sold to British Teltherm Company Ltd. in the early/mid 70’s and the bulk of the operation eventually moved to Newmarket and there is a trend of more low budget products. But in the 1980’s British Teltherm, by then known as Theltherm Industries NZ ltd, was taken over by a merchant bank called Equiticorp that had a reputation for being a serial asset stripper. Equiticorp then failed spectacularly in 1989 after some highly speculative lending and brought down with it no less than 153 companies that they owned, those were either sold off or in most cases liquidated and the latter appears to have been the fate of Sonophone. Not to be confused with USA based wind instrument manufacturer Sonophone or Zonophone. American company that began manufacturing hearing aids in the early 1930's but diversified into manufacturing pickups, tape recorder heads, microphones and other transducers, and even the odd valve along with rechargeable batteries and a short lived range of hi-fi separates. Stopped making any audio related products apart from pickups and mic's in the early 60's and the audio division was sold a little later to Astatic, but the company is still around under another name and still manufacture hearing aids. More info from the Sonotone history page. USA based maker/reseller of car audio installation and accessory products, taken over by Recoton in 1994. No relation to the software company of the same name. 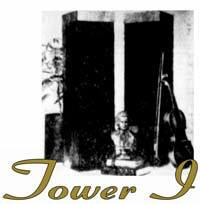 Company based in Los Angeles, California, USA and formed in 1972 by Barney Rigney, a former vice president of JBL. It manufactured an unusual weather resistant, small and light (1kg) full range speaker that could be bought in three shapes, round, square and octagonal with a choice of grill colours that included rust, blue, gold, black and white. The ABS plastic enclosures were only delivered in white though but could be tilted, originally released without a name they were later referred to in company brochures as "Extraspeakers" and were advertised as an auxiliary speaker unit. The company moved to Van Nuys in California in late 1972 and in 1974 introduced a free-standing tower speaker called "Tower I" that they referred to as a "pedestal", since it was designed to be strong enough to have ornate object placed on it, a "wife friendly speaker" in other words, it is in design and function uncannily similar to modern floor standing speakers, but those did not start showing up until the 1980's so this is a pioneering design in some ways. The Tower I is a 2 way system with 2x 8" high compliance woofers and a 2" tweeter, featured a power handling capacity of 50W RMS and is 37 inches tall and 10x10 w x d. The enclosure is ported and is made out of MDF with an oiled walnut veneer and featured a black knit grille. RRP when introduced was 119.95 USD. Later the same year the company also released an after-market automotive speaker called simply "the car speaker", it was a wedge shaped black ABS plastic enclosure with a foam grills similar to the one on the Extraspeakers but those could only be had in black or chrome plated! 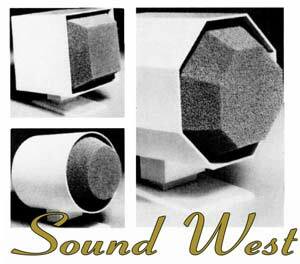 Sound West has not been heard from since 1975 and nothing is known about its operations since. UK trading company based in Stockport in Cheshire. Started life in 1998 as Antari UK Ltd. and distributed Antari lighting products in the UK, started to sell Chinese lighting and DJ products under its own name in 2002 and changed its name to Source Manufacturing later that same year, went insolvent in 2005 but owner Darren Cragg went on to found Zoom Manufacturing later the same year. Originally founded in 1963 in San Antonio, Texas, USA by Daniel E. Meyer as DEMCO (aka Daniel E. Meyer Company) but was incorporated in 1967 as South Western Technical Products Corporation which was in daily usage shortened to SWTPc or SWTP. Initially the company supplied electronic kits to go with construction articles that Mr. Meyer had written for electronic magazines, most of these where cheap audio related things like simple pre-amps and so on but there were also more novel products such as a Térmen Airovox (Theremin) and suchlike. In the latter half of the 60's SWTP had some quite good audio product kits in their catalogue and by the early 70's they were also offering fully built products such as Hartley Products loudspeakers etc. The company took over Lambert Labs in 1971 and with that takeover got a number of audio related products but seems to have discontinued most of those shortly thereafter. During the 70's the emphasis drifted away from audio products towards digital electronics and SWTP became quite well know in the computer world with their line of SWTPC computers based around Motorola? processors that were introduced in the mid 70's and for a time the company was one of the better know microcomputer manufacturers in the USA. SWTP had exited the computer and audio business by the early 90's and had become a POS service unit and changed its name to Point Systems and went out of business by the mid 90's.